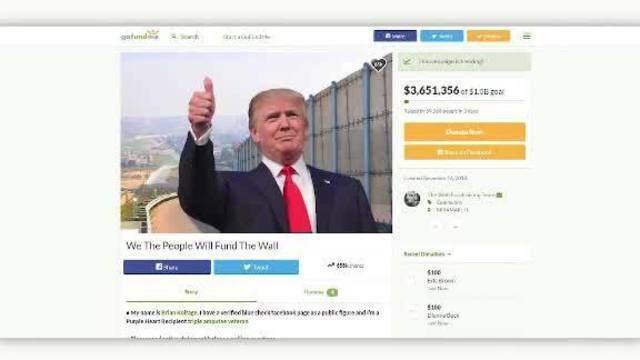 TAMPA, Fla.(WFLA) - GoFundMe will be giving refunds to thousands of people who raised money to help fund President Donald Trump's long-promised border wall, BuzzFeed's Brianna Sacks reports. The online fundraising campaign, started by Brian Kolfage, a triple amputee and Purple Heart recipient, raised more than $20 million from 334,860 donations, falling short of its $1 billion goal. Kolfage initially told supporters all donations would be used to pay for the wall. "However, that did not happen," GoFundMe spokesman Bobby Whitmore said. "This means all donors will receive a refund." Kolfage later said the $20 million raised would go toward a non-profit called "We Build the Wall, Inc." to help the government build segments of the wall for lower costs. A BuzzFeed investigation revealed the Kolfage has a history of "peddling right-wing misinformation on Facebook" and pocketing money intended for other causes. "The veteran has also spearheaded other crowdfunding ventures over the years, raising thousands of dollars on GoFundMe with the promise of helping mentor fellow vets at military hospitals, but spokespersons for the medical centers said they have no record of Kolfage working at their facilities or donating any money," Sacks wrote in the report. All donors will get an e-mail from GoFundMe regarding the refund. "If a donor does not want a refund, they must proactively elect to direct their donation to that organization. If they do not take that step, they will automatically receive a full refund," Whitmore said in an e-mail to Sacks.